The all-you-can-eat buffet has been a Las Vegas staple for decades, but the buffet experience has taken a turn to the upscale in recent years. 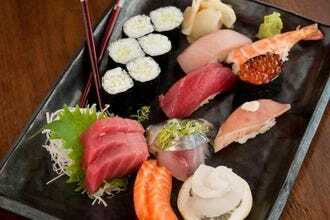 While most buffets are no longer considered cheap, the good news is that the quality of food has improved significantly. Single serving sizes are more of a thing these days, as are trendy dishes well outside the old buffet standards. 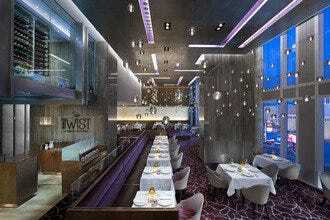 Wicked Spoon at The Cosmopolitan of Las Vegas and Studio B at the M offer high-end dishes, seafood and international dishes--plus Wicked Spoon offers a bottomless beverage option and Studio B includes some servings of wine, beer and other adult beverages with your meal. 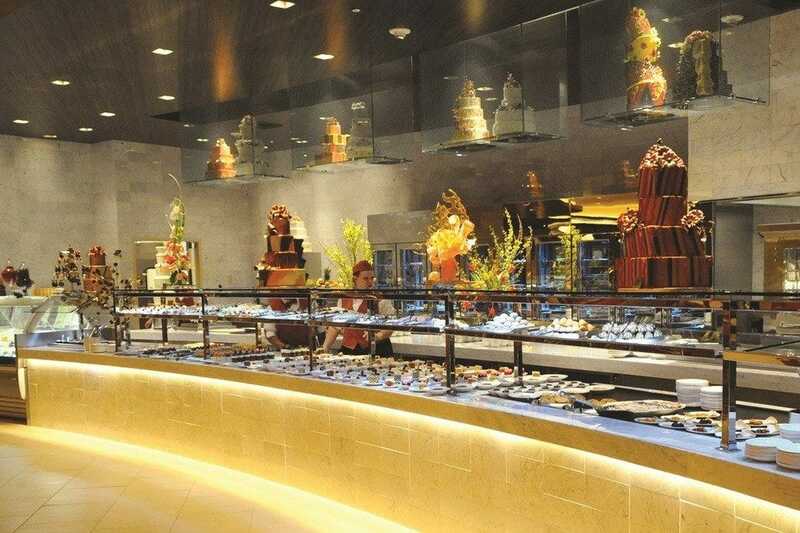 One of the most acclaimed buffets in Las Vegas is currently A.Y.C.E. at the Palms. This new and improved buffet has a whole new approach to stations, breaking them into food types. 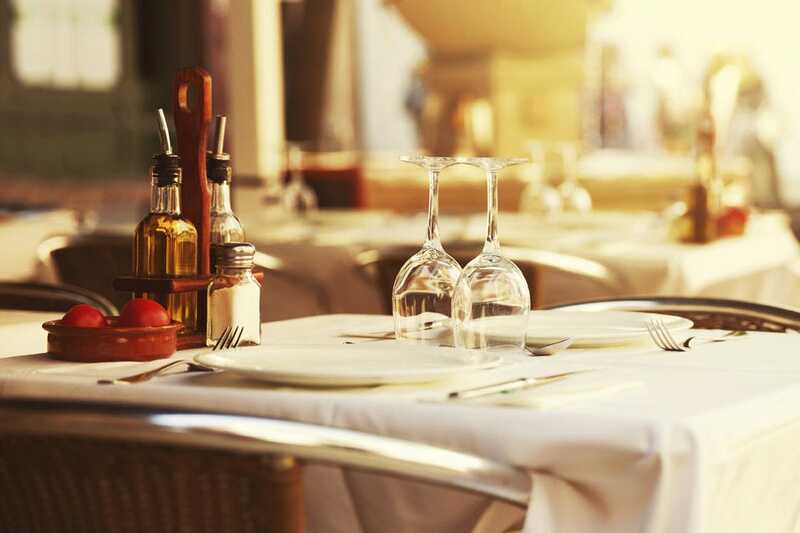 The emphasis is on quality, while still offering an impressive array of dishes. 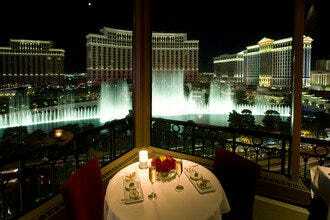 As a bonus, it’s also a great value and just a short drive from the Strip. While buffets aren’t the incredibly cheap option they once were, you can find some buffet deals off the Strip and in Downtown Las Vegas. Breakfast is generally the least expensive meal of the day, regardless of the buffet you choose. At Main Street Station’s Garden Court Buffet, if you sign up for a player’s card you can get breakfast for less than $10. 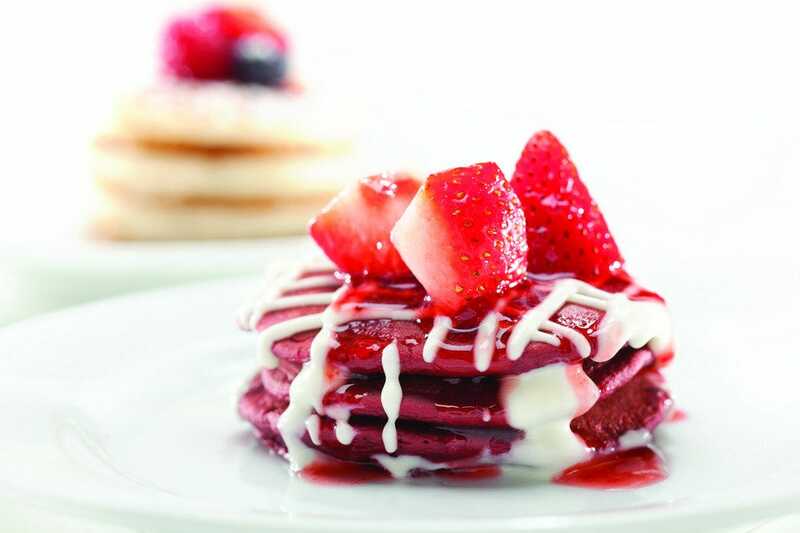 Scroll on down to read all about Las Vegas' 10 best buffets. 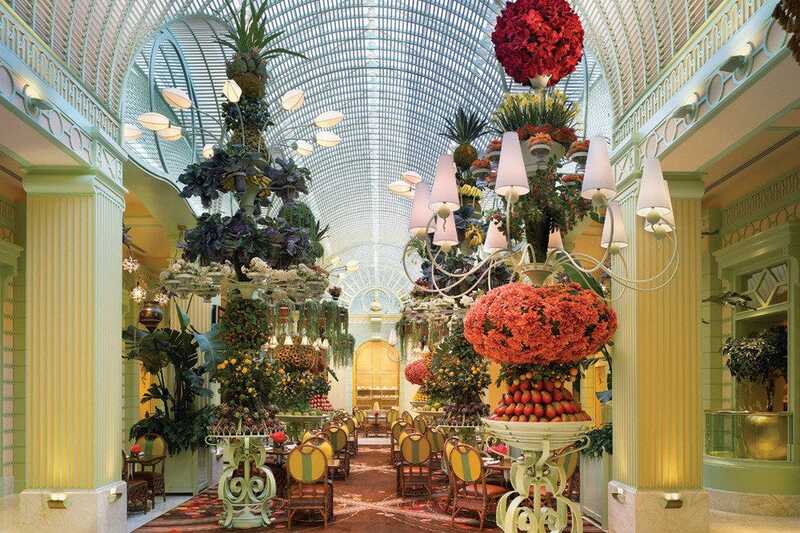 At one time, Las Vegas was once called the "Buffet Capital of the World." The city's culinary style has evolved, but there are still plenty of all-you-can-eat spreads even though buffets aren't always the inexpensive option they once were. Main Street Station's buffet is still affordable, and it's loaded with the wide variety of dishes you expect to find at a buffet. 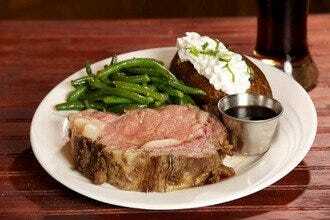 Located just off Fremont Street, this buffet has been known as one of Downtown's best buffets for years. 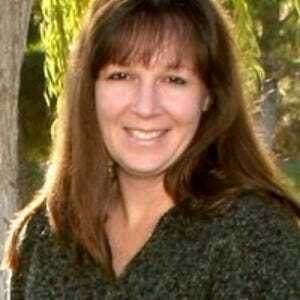 Diners have plenty to choose from, and the limitless portions are a great idea if you're trying to fill up big eaters. With the wide selection of dishes, everyone is sure to find something they like. 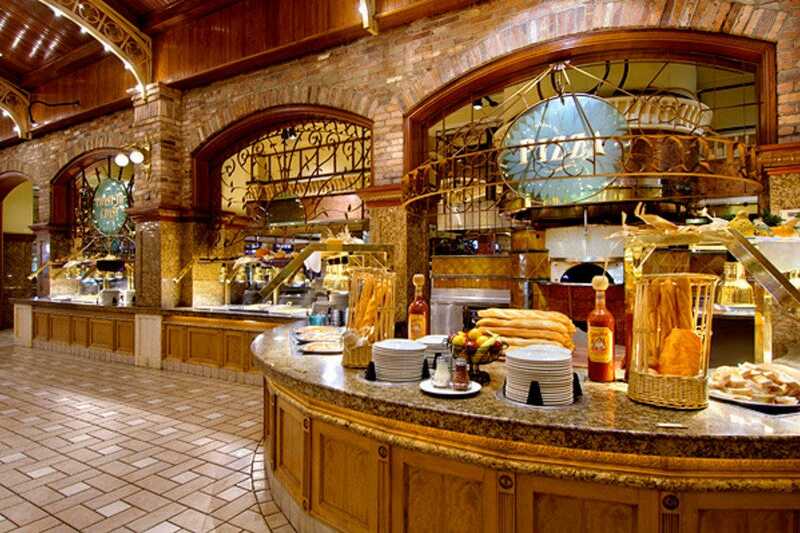 Le Village Buffet at Paris Las Vegas consistently gives diners a great selection of dishes, with fare from several prominent regions of France as well as plenty of American dishes. It may not be the newest or biggest buffet on the Las Vegas Strip, but that doesn't mean it isn't still one of the best. 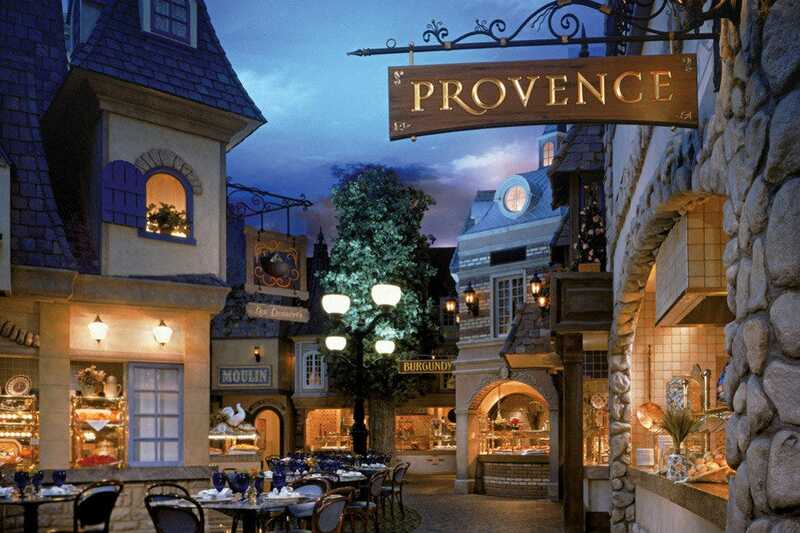 Open for breakfast, lunch, dinner and weekend brunch, Le Village offers guests a French village setting while serving such delicious dishes like the juicy prime rib for lunch or dinner, or the decadent truffle macaroni and cheese. 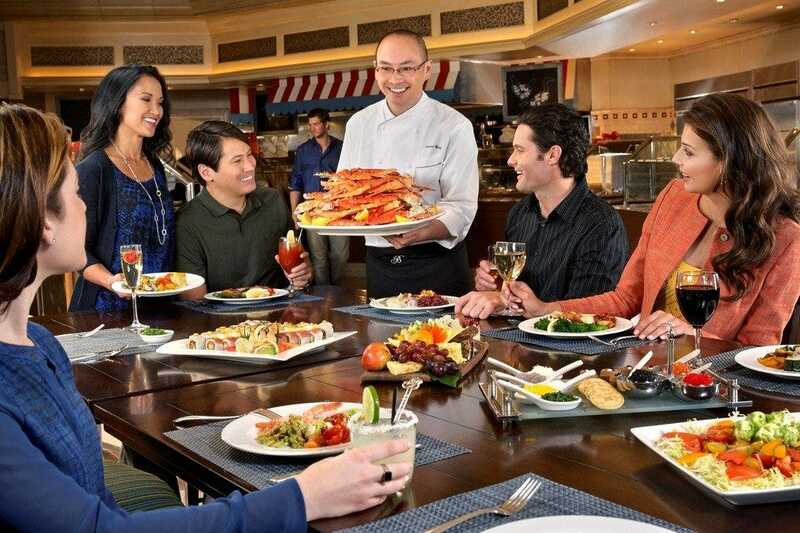 If you like seafood, Le Village Buffet offers crab legs during dinner hours, and don't forget about the macaroons and vanilla bean créme brulee for dessert. They also offer an all-you-care-to-drink special. 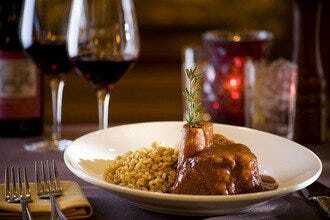 Le Village also offers reservations on OpenTable, giving customers a way to avoid the long lines commonly found at buffets. For a wide variety of food, it's hard to beat a buffet. 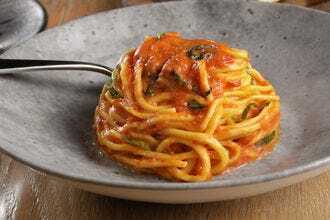 The numerous types of food available at the Aria's buffet include gluten-free pizza and pasta, as well as a wide selection of fresh seafood and salads. Let the server know you're looking for gluten-free (or vegan, or dairy-free) dishes and they'll be happy to help you, or the chef may even come and show you what's available. Aria's buffet offers a tempting array of dishes that will suit guests regardless of what kind of foods they're looking for. 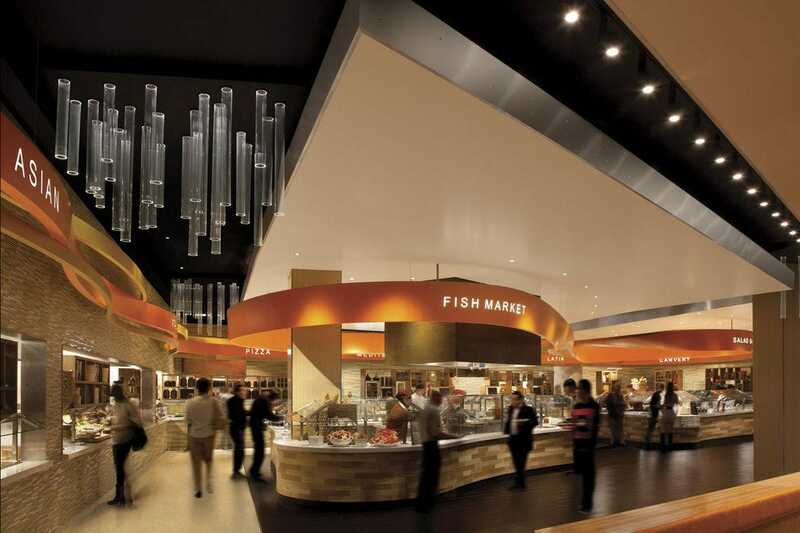 The Buffet at Aria won't be the cheapest buffet you'll find, but the quality of food is worth the cost. Breakfast, lunch, and dinner are served Monday through Friday, brunch is offered on the weekends, and a gourmet dinner is served Friday through Sunday. Every Sunday BLT Steak transforms itself into the Sterling Brunch, an opulent and expensive brunch buffet of legendary status. The Sterling Brunch is a bit of a rarity in Las Vegas--it's a long-running event that isn't showing any signs of going away. An aura of old-fashioned exclusivity gives the Sterling Brunch an atmosphere that's great for special events and holidays like Mother's Day. This is definitely not a bargain-buy buffet. At $90 per person, it's a splurge. 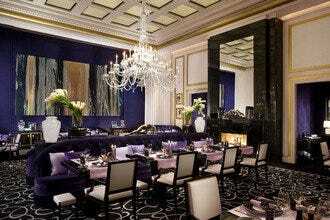 You get a full array of upscale food choices for that price: caviar, lobster, sushi, oysters and filet, for instance. Bring a big appetite to take advantage of indulgent dishes like truffle mashed potatoes, banana bread pudding French toast and charcuterie. In addition to the traditional buffet line, you can also place an order with your server for items like lobster bisque, eggs Benedict, Caesar Salad and a chopped vegetable salad. Not your typical buffet by any means, The Buffet at Wynn Las Vegas truly serves up an elegant all-you-can-eat dining experience. Open for breakfast, lunch, dinner and a lavish Saturday/Sunday brunch, it features 15 live-action cooking stations offering an array of hot and cold dishes. Hungry diners can choose from a wide range of dishes, including Asian and Italian cuisines, meats at the carving station or prepared on a grill, hot and cold seafood, ceviche, wood-stone oven-fired pizzas and a crepe station for Friday and Saturday dinner service. Don't miss the sweet patisserie, featuring warm pastries, chocolate fountain dipped delicacies and an array of tasty cakes and other creations made daily by the buffet's pastry chefs. Often hailed as one of Las Vegas' best buffets, Bacchanal Buffet at Caesars Palace boasts more than 500 items for guests to choose from daily. 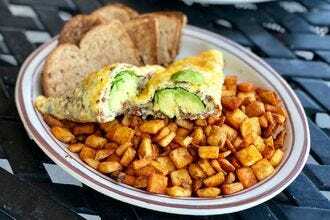 Open for breakfast, lunch, dinner and Saturday/Sunday brunch, a team of seven specialized chefs oversees the preparation of the majority of the food in front of diners. 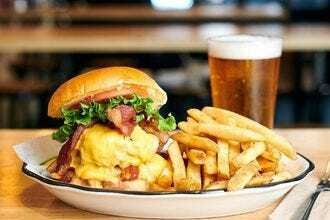 There are nine different open kitchens available--Mexican, Italian, Japanese, American, Seafood, Chinese, Pizza, Deli and Dessert--each offering their own plated, made-to-order and mini-dishes. 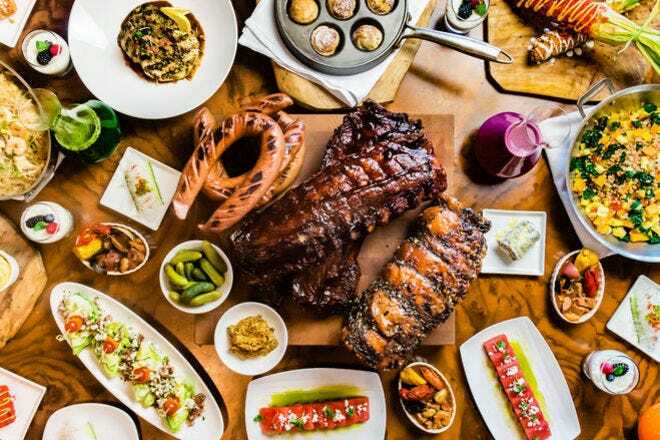 Bacchanal Buffet features an impressive carving station with prime rib, brisket, rotisserie chicken and several other succulent items for meat-lovers to salivate over. If that's not enough, fill your plate with chilled king crab legs, Australian lamb, hand-made dim sum, pho or baked-to-order chocolate lava cakes. Since the popular Bacchanal Buffet serves over 3,000 people every day, be sure to take advantage of the interactive check-in kiosks to avoid long lines. The Buffet at Bellagio offers a gourmet, all-you-can-eat dining experience with selections not normally associated with a buffet. Open for breakfast, lunch, dinner and Saturday/Sunday brunch, guests can revel in a variety of dishes from Italy, China and Japan as well as fresh seafood and traditional American delights. Live-action cooking stations offer meals made-to-order, or for a truly unique dining experience, guests can experience the city's first Chef's Table within a buffet. Ideal for special events or large family gatherings, the experience is available nightly for dinner with an advance reservation and includes a team of skilled chefs who pamper guests from beginning to end, preparing an assortment of fine culinary dishes tableside. A favorite buffet with Las Vegas locals, Studio B buffet at M Resort boasts more than 200 dishes for lunch and dinner daily. The selection size is impressive and also includes unlimited beer and wine at no extra cost. Quality here is on par with anything found on the Strip, but at a lower cost. On Friday, Saturday and Sunday, Studio B offers a seafood buffet and a seafood brunch is served on Saturdays and Sundays. A prime rib brunch is offered on Fridays from 11 a.m. to 2 p.m., and the champagne breakfast will wake up your Sundays with bubbles from 9 a.m. to 11 a.m. No matter what meal you stop in for, remember to save room for dessert since Studio B is sure to have something sweet and delicious. With its trailblazing small-plates approach, Wicked Spoon at The Cosmopolitan of Las Vegas truly revolutionized the Las Vegas buffet when it opened in 2010. While a few other buffets in town have since adopted the individual plates concept for their fare, Wicked Spoon still remains one of the city's most innovative buffets. 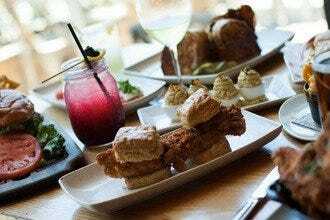 Open for brunch and dinner seven days a week, Wicked Spoon boats a multi-ethnic spread of top-quality dishes in a sleek, sophisticated setting. In addition to frequently changing specialty stations serving seafood, meats, and other selections, look for the dessert station featuring 18 different flavors of gelato and sorbet. Wicked Spoon also offers a happy hour daily from 3 to 5 p.m. featuring select beers and cocktails for $5. The new buffet at the Palms has been attracting a lot of attention with its mouth-watering selection of food. Upping the buffet game, A.Y.C.E. (for All You Can Eat) doesn't offer the standard Mexican, Asian or Italian stations. Instead, they have The Greenery (greens of all kind), The Hearth (brick oven casseroles, pizzas and other dishes), The Roastery (international fare like Moroccan lamb, dim sum, bao buns and so on), World Pan (more international food), Smoke & Fire (proteins galore--bourbon glazed ham, barbecue ribs, hot links and a smoked Brisket Benedict, among other choices), Revival (freshly pressed juices, vegan dishes, wellness-focused dishes) and Sweet & Light (dessert, of course). Each station is loaded with selections focused on fresh, innovative dishes. Prices are an absolute steal here, with a full-price dinner going for $21.99.